We’ve all seen on TV and printed ads how sensitive about the land the oil industry is. They drill many wells from just one pad, avoiding surfance disturbance. If the land cannot bear any suface occupancy, they drill at an angle under it (called “directional drilling”). Yes, they can do these things, just like it shows on the TV, but the reality in Wyoming and throughout the Rocky Mountain West, is that they don’t do it that way because it is cheaper not to, except for few showcase examples where they can take the media and politicians. Drill pads on The Mesa (Pinedale Anticline). This is a new gas field, north of Jonah. 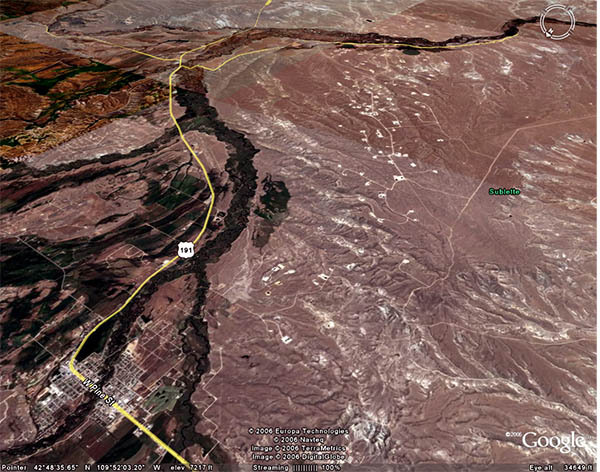 The town of Pinedale, WY is in the lower left corner. View is to the SE. The deer population on The Mesa is way down. Where are the animals going? By Whitney Royster, Casper Star Tribune. Somehow, I don’t think it is drought per se. This decline was also predicted last year in a major study. This looks like an arid region. I wonder what impact these pads are having on local watersheds. You can see what it looks like by going to the web cams I linked to. There’s the Jonah gas field cam and the Boulder web cam. It is sagebrush steppe, but beautiful, clear rivers and creeks tumble out of the adjacent Wind River Range into the sedimentary Green River Basin where they muddy up, but there is more sediment going into them now (I think). In 2004 I camped on a hill about 5 miles from the first of the Jonah wells, and found deep cryptogamic crust between the sagebrush and grass. I was amazed. At the upper end of the Green River Basin, the land rolls up into the Gros Ventre Bountains. Aspen and pockets of fir appear and finally it is all forest and mountain meadow. This is the wolf and grizzly bear country.